Our Lady of Peace Catholic Church was known as St. Mary’s until 1982. In 1950 Bishop McNamara appointed Father John Savukynas administrator of St. Mary’s Mission, also known as the Tri-State Mission, to serve the growing number of Catholics in the Clarendon Hills area. Within the same year, Father Alphonse Micka (Fr. Al) replaced Fr. Savukynas as administrator. Fr. Al would remain pastor and administrator until he retired in 1997. St. Mary’s Mission continued to grow, and in 1959 it became St. Mary’s Parish. The Marian Fathers at the Marian Hills Seminary assisted Fr. Al in his ministry to the parishioners. The Marian Hills Seminary chapel and grounds served as the first church for St. Mary’s Parish. A beautiful tree-lined driveway led to the chapel where Sunday Mass, weddings, baptisms, and First Communion services were celebrated. Bishop McNamara believed that St. Mary’s should have its own church building. Consequently, Fr. Al initiated a building fund to purchase land for a future church. In 1959 the parish purchased eight acres on 75th Street and Plainfield Road as the site for a combined church-school building. Fr. Al, local clergy, and parishioners gathered for a groundbreaking ceremony on February 4, 1962. When the church-school building opened in 1963, it had eight classrooms and a gym. The gym served as the church; folding chairs with kneelers provided seating for church services. When the gym was not in use for church services a curtain hid the altar. St. Mary’s School opened in September 1963 for first graders. After the Sisters of St. Casimir accepted Fr. Al’s invitation to teach at the school, additional grades were added. By 1966 St. Mary’s School provided education for students from first through eighth grade. 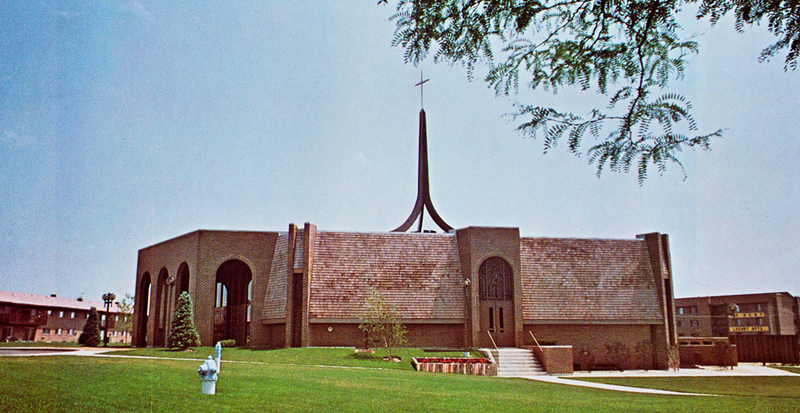 The rectory, a must needed addition to the parish complex, was built in 1968. Prior to the construction of the rectory, Fr. Al and his assistant pastor Fr. Brown had to travel from their residence at Marian Hills Seminary to the parish complex on 75th Street. As the congregation increased, the combined church-school building could no longer adequately serve the parish’s needs. In 1970 the parish formed a building committee for the purpose of constructing a church. 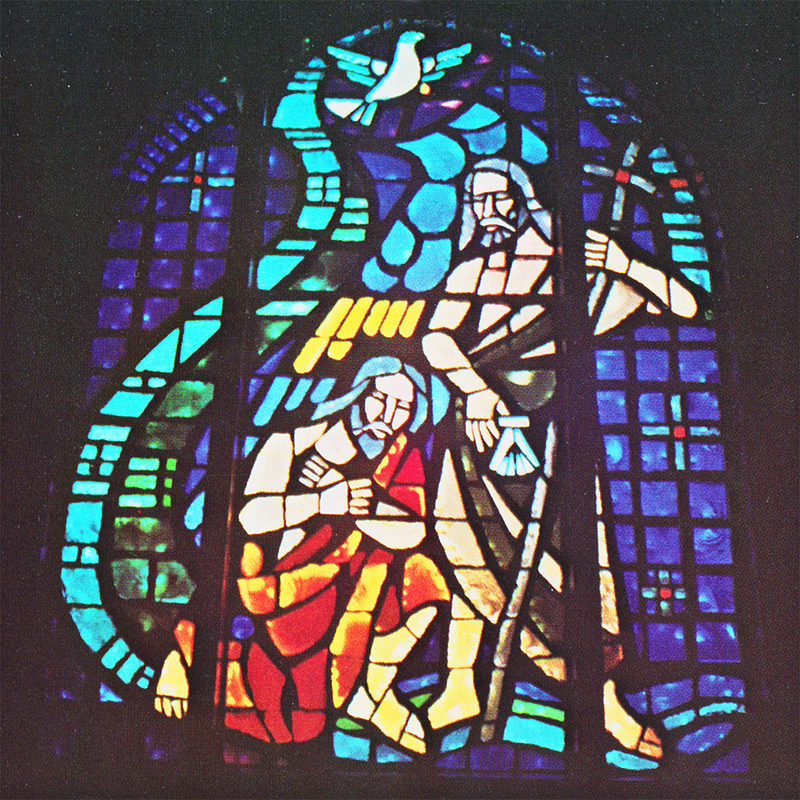 The committee selected Ewald Associates as the architect for the building, and commissioned John E. Bera to design and create faceted dalle stained glass windows for the church’s interior. 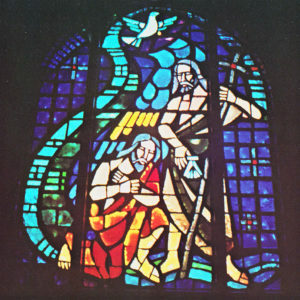 The stained glass windows reflect sunlight throughout the church much as a prisms would and contribute to the contemplative beauty of the church’s interior. Parishioners enthusiastically supported the church project and helped raise funds. 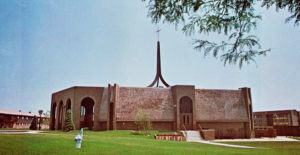 In July 1975 St. Mary’s Parish broke ground for the church and on Mother’s Day, May 7, 1977, the congregation celebrated the first Mass, a First Communion service, in the new building. Fr. Al proudly acknowledged the parishioners’ generosity which allowed the building to be completed debt free. In 1982 Fr. Al requested that St. Mary’s be re-named Our Lady of Peace to distinguish the parish from other area churches called St. Mary’s. On September 12, 1982, Bishop Imesch rededicated the parish. Fr. Al retired in 2006 having served the parishioners of Our Lady of Peace Parish (formerly St. Mary’s) for 42 years. Our Lady of Peace Church remains a vital part of the community and Our Lady of Peace School continues to educate area students.